That’s what the Willie Rushton used to claim in olde worlde ads for the Double Decker chocolate bar. Now there’s a breakfast cereal making the same claim. 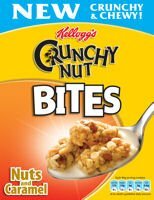 Crunchy Nut Bites are “new bite-size pieces of crisp golden cereal baked with crunchy chopped nuts and chewy caramel”. I haven’t read the side of the box to check the ingredients, but isn’t that a bit rich at a time when people are worried about obese children eating too much sugary cereal?